It’s that time of year again. In many places around the country, it is getting cold; however, that doesn’t have to keep you off the bike. 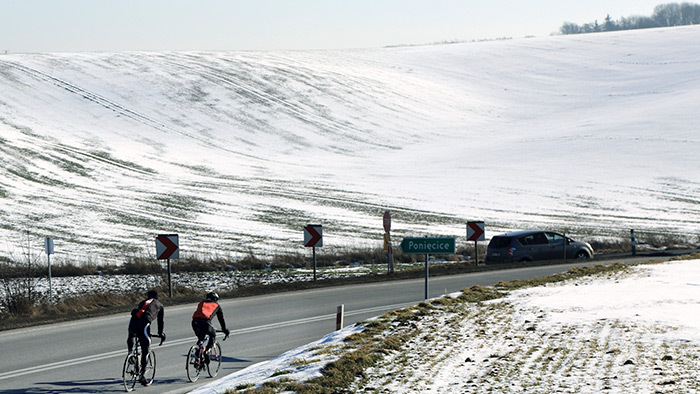 Follow these eight winter cycling tips for an enjoyable riding experience this season. To stay warm during a winter ride, think in terms of your head, hands, feet and torso. Most of your body heat escapes through your head, so using a balaclava under your helmet will help keep you warm. Wear either long fingered gloves or mittens to protect your hands, and thermal socks to keep your feet warm. If it’s really cold, consider wearing two pairs of socks and use thermal shoe covers to keep the wind off your feet. Wear layers to keep your torso warm, including a lightweight, breathable outer jacket that is both water and wind resistant. It also helps to use fabrics that wick moisture away from the skin. This will help keep you drier and warmer. As a general rule of thumb, use leg warmers to protect your knees when the temperature drops below 60° F.
Never start your ride with a chill. This is a recipe for a miserable outing because your extremities will get cold very quickly. Start your ride feeling warm, perhaps even a bit too warm. Have a hot drink in a warm room just before you step outside. This will allow you to warm-up on the bike more comfortably. In many locales, drivers do not expect to see cyclists on the road during winter months. Wear brightly colored clothing, and use reflectors and lights, even if you won’t be riding after dark. It can be difficult to spot cyclists during twilight hours and a good set of bicycle lights (e.g., headlight, rear flasher) will significantly boost your visibility. 4. Plan your route in advance. There can always be debris on the road, bike path and shoulder; however this is more common during winter months. Determine your route in advance and make sure it is relatively clear of debris and safe for cycling. In addition, shorten your route during the winter. Otherwise, you may run out of energy or just get too cold and find yourself far from home. Identify a circuit near your residence that allows you to cut the ride short if necessary. 5. Pay attention to the wind. Whenever possible, try to do the first half of your ride into a headwind and return with a tailwind. This allows you to tackle a headwind when you are fresh and gain the benefit of a tailwind on your way home. This is even more important during winter because it allows you to avoid an icy wind during the second half of your ride when you are sweaty and tired. Misery loves company. Okay, winter riding doesn’t have to be miserable but there are tremendous benefits to riding in a group. It can be a more enjoyable experience, you can take turns shielding each other from a biting wind and sharing conversation makes the time go by faster. It’s also safer and more convenient if someone has a mechanical problem. 7. Take care of your bike. Winter riding can wreak havoc on your bicycle so pay attention to its care and upkeep. Make sure you clean the bike, chain, gears, brakes and wheel rims on a regular basis. That means after every ride in wet conditions. It also means lubing the chain and gears on a more frequent basis. You may want to get a tune-up at your local bike shop at the beginning and end of winter to make sure it is in good repair. 8. Do some riding on an indoor trainer. It can get too cold and miserable to ride outdoors. This is particularly true if you are a competitive cyclist. You are not going to get a very effective workout riding in really cold, windy, icy or wet conditions. Riding an indoor trainer provides a safer riding environment and allows you to achieve the same training effect in less time. It’s convenient for most cyclists and is very effective for high-intensity workouts. You can still ride outdoors but using a trainer allows you to be more selective about when you will expose yourself to the elements. It also provides you with a change of pace. Use your outdoor rides for low-to-moderate intensity efforts and the trainer for more intense sessions. Tyrone A. Holmes, Ed.D., CPT, is a certified personal trainer through the American Council on Exercise, a Level 1 cycling coach through USA Cycling and a TrainingPeaks Level 2 Certified Coach. He provides Cycle-Max Coaching for cyclists and multisport athletes who want to improve their performance on the bike and Run-Max Coaching for individuals who want to run longer and faster. Dr. Holmes has published several books including "Training and Coaching the Competitive Cyclist," "Developing Training Plans for Cyclists and Triathletes" and "The Business of Training and Coaching." Visit his website at www.holmesfitness.com and review his training plans at www.holmesfitness.com/training-plans.